A week ago, Russia’s leading retailer of shoes, TsentrObuv (“Shoe Center”), was taken to the Moscow Arbitrazh Court by 99 plaintiffs, the largest group of creditors ever recorded against an insolvent business of TsentrObuv’s size and national name recognition. This is only the most recent claim to be filed against TsentrObuv and its associated companies. More than a thousand cases are pending in the arbitrazh court system nationwide. The debts are owed to Chinese and Russian suppliers of the shoes which the TsentrObuv chain of shops has been selling. Some of the debts are owed to owners and agents for the lease of hundreds of shops; to construction companies for their fitting out; to freight delivery companies; to advertisers and employees; and to banks and trade finance houses. The debts have yet to be toted up by the court –appointed trustees; they are estimated in the trade at more than Rb29 billion – that’s $446 million. 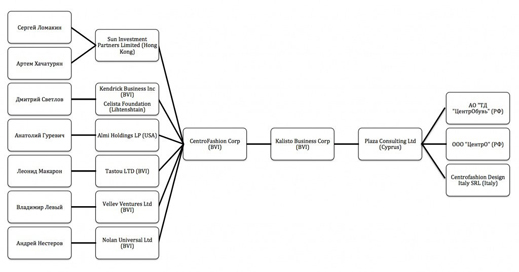 Offshore in Cyprus, British Virgin Islands (BVI), Liechtenstein, Hong Kong, and Delaware (US), where a chain of entities has been passing the Russian cashflow of TsentrObuv through to company names and trusts controlled by the shoe group’s shareholders, the debts personally guaranteed to banks have been reported by the company at $143 million in US dollars and Euros, plus almost $270 million equivalent in roubles. That was in 2012. How much of these offshore debts is still owed is not known. 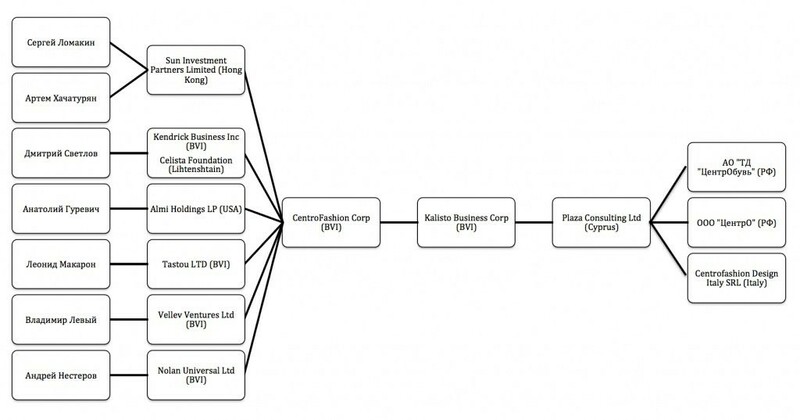 Just one of the companies, Kalisto Business Corporation of BVI, was reported as owing $33.5 million about one year ago. Since then the shops have been closing down, the revenues plummeting, the number of creditors multiplying. Sources at TsentrObuv’s headquarters in Moscow admit the group is in liquidation. But this is not a normal bankruptcy. Criminal investigations now under way in Moscow, Tomsk, Ryazan, and other cities and regions indicate that shareholders and managers of TsentrObuv have been looting the cash takings of the shops, along with loans from banks, and hiding the money offshore. Theirs has been no soft-shoe routine. Altogether, the TsentrObuv stealing scheme appears to have made off with at least half a billion dollars. When President Vladimir Putin promised last week in St. Petersburg that the Kremlin is committed to “drastically reduce illegal criminal prosecutions”, he might have asked the Russians in the audience to look down at their shoes. 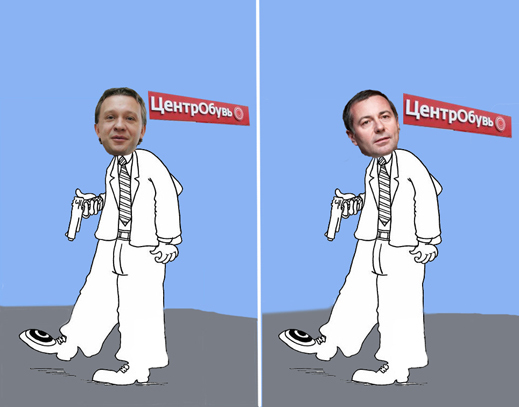 If they came from TsentrObuv, the question to be asked of the Kremlin’s new “working group on law enforcement in entrepreneurial activity” is not how much prosecutors have done to protect the shoe market, but why they have done so little for so long. The affair of TsentrObuv puts the Kremlin shoe on the other foot. The story of TsentrObuv started in 1996. The only publicly available report from the company was issued in June of 2012 as a financial summary for the year before. This says the group started with the TsentrObuv and other brand-name shoe shops in 1996, and over the next four years these retail outlets were merged into a single brand-name organization. The TsentrObuv brand company was then registered in Russia in 2005, according to this document. A second brand, with different marketing appeal and pricing, was introduced in 2008. It was called Centro. The 2011 report runs for 36 pages, and mentions only one shareholder – Andrei Nesterov (right). He is reported as the chief executive of TsentrObuv, a member of the board of directors of Centro, and sole shareholder on a list of personal guarantees for bank loans issued and outstanding as of mid-2012. The chapter of the report on the board of directors omits to identify the names. Two have been reported in the Russian press as founders of the group in 1996 — Dmitry Svetlov and Anatoly Gurevich. 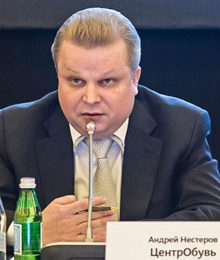 They have been reported in the business press as US nationals; Gurevich reportedly owns a Delaware front company called Almi Holdings through which he continues to hold a stake in the group. Nesterov has been identified in the Russian press as owning his share in the group through a BVI front called Nolan Universal. The 2011 report provides a partial summary of financial results for the group. These indicate turnover of Rb27.8 billion ($946 million) and profit of Rb315.2 million ($11 million). There were 718 shops in all — 528 shops with the TsentrObuv name, 137 outlets for Centro, and 53 franchisees. No auditor has attached a note or signature to warrant these results to be accurate. Debts for 2011 were said to have doubled from the previous year to Rb11.8 billion ($402 million). The list of loans reportedly guaranteed by Nesterov come to slightly more than that amount. The report — drafted and released at a time when the group shareholders were reported to be preparing for an initial public offering (IPO) — claims the rising debt was being invested in increasing the number of retail shops. TsentrObuv has issued no further annual report or financial statement since mid-2012. 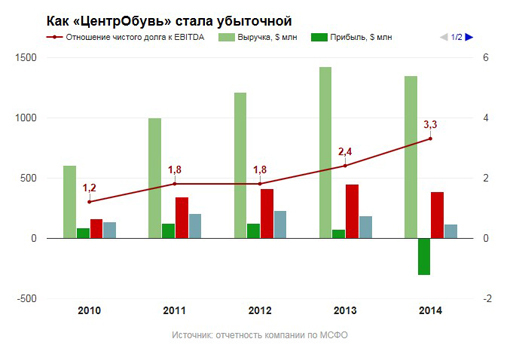 Subsequent business media reporting, partially sourced to shareholders Svetlov and Gurevich, suggests that turnover (light green bar in the chart below) peaked in 2013 just below $1.5 billion. Profit (dark green) that year dropped to half its 2011 level, or about $5 million. Borrowings (red) were evidently growing towards the $500 million mark. As earnings (Ebitda, blue) dropped, the ratio between debt and earnings jumped to 2.4. In the following year, 2014, turnover slipped, profit turned into loss, and the ratio ballooned by 38% to 3.3. 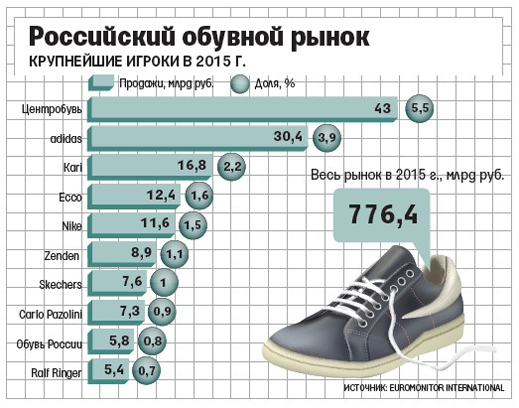 To the naked eye, TsentrObuv appeared to be the leading shoe retailer in Russia, way ahead of its competitors in the domestic market. One in every 20 pairs of shoes sold in the market came from TsentrObuv. Source: INFOline-Analitika. Both tables have been published here. In reality, with the aid of retrospective accounting, court records, and leaks to the press by one TsentrObuv shareholder against another, what was happening turns out to be a classic pyramid scheme. Instead of investing bank loans in the expansion of trade, the proceeds of loans were being diverted offshore through fictitious supply and purchase contracts with companies controlled by manager-shareholders. New shops were being opened in order to generate the revenue to cover the rising interest costs of the borrowings. But bills falling due for shop rent, supplies of shoes, freight and deliveries, staff wages, and everything else needed to keep the retail operation going were postponed or ignored. Loose cash was also diverted. In 2015 TsentrObuv managed to report revenues up slightly on the year before at Rb43 billion ($705 million). The dollar value of the turnover had halved on account of the rouble devaluation of November 2014. There was also a sharp drop in sales from the Ukraine and Poland. As much of the loan book remained in hard currency, and the turnover in roubles could not keep up, a crash was inevitable. This materialized when unpaid creditors and banks lost patience and filed their claims in court. What had happened was obvious. Somehow it had escaped the notice of the bank lenders to TsentrObuv that the loan total was rising faster than revenues, and that the debt to earnings ratio was accelerating out of control. Just two banks have so filed claims in the domestic arbitrazh courts – state-owned Gazprombank (Rb8.6 billion, $141 million) and Moscow Credit Bank (no amount reported). Other bank lenders identified in the company’s 2011-2012 report are Sberbank, Raiffeisen, Otkritie, Promsvyazbank, Absolut Bank, Credit Europe Bank, and Alfa Bank. VTB has also been mentioned as a creditor in some business media. While no audited accounts for TsentrObuv have appeared in public, the banks are likely to have required and received confidential accounts quarterly. The bankers appear to have had their eye on the shoe revenue line; they failed to detect the pyramid. Asked to explain, Gazprombank requested the question in writing by email, and then did not reply. Who benefitted, who was responsible – to these questions there are no answers yet in the court records. Asking the questions has become a criminal matter, according to police, prosecutor and Interior Ministry disclosures in Moscow, Yekaterinburg, Tomsk, and Kazan. Instead, the Russian business media are reporting recriminations among the shareholders of the group. These include the founding pair of shareholders, Svetlov and Gurevich. Reportedly, they sold down (but not out) to Sergei Lomakin (lead image, left) and his partner Artem Khachaturyan (also spelled Khachatryan). They were well-known in the Russian retail market as investors in the Kopeika supermarket chain, which they sold to the Alfa group’s X5 grocery chain in 2010. 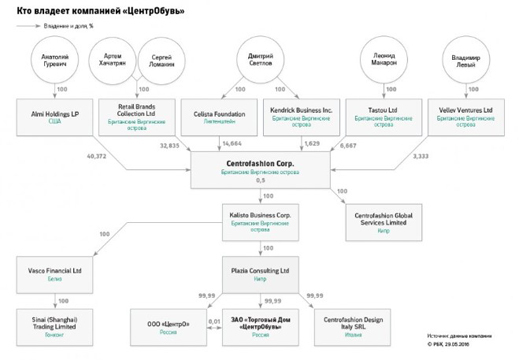 Lomakin and Khachaturian reportedly held their stake in TsentrObuv through a Hong Kong-registered entity called Sun Investments (aka Retail Brands Collection). Lomakin and Khachaturian are reported in the Russian press as selling down (also not out) in 2014-2015. One of the reported buyers was Dmitry Vernimont (below, right). He doesn’t appear in a shareholder chart prepared by the RBC newspaper in May 2015. Neither does Nesterov, the previously reported chief executive. At a date in June 2015 — apparently some time after this chart was prepared and published — an agreement was struck between three shareholders of TsentrObuv on how they proposed selling an equity stake they valued at $50 million, plus debts of $33.5 million. The shareholders aren’t named in the two-page agreement, and it is unclear who is referred to as “old shareholders”, “new shareholders”, and “investors”. The signatures at the end of the document belong to Khachaturian, Nesterov, and Gurevich. Here is the document as published. In the press of recent days, Palikhata is reported to be making an asset raid on TsentrObuv. If that’s true, he is the first reputed Russian raider to want to take over a company already in the hole for half a billion dollars, and under police investigation for criminal fraud, embezzlement, tax evasion and money laundering. The allegations by one shareholder against others can be found in the Russian kompromat media — click for one; and click for another. State prosecutors are not confirming the results of their investigations yet, and no criminal charges against any individual shareholder have been filed in court. There are press reports that some of the shareholders have left Russia for abroad, but this cannot be verified. A sampling of the civil recovery claims can be read here in this latest arbitrazh court file, dated June 20, 2016. Procedurally, the cases are at an early stage, and there have been no detailed findings by judges on how the money disappeared from TsentrObuv onshore into the offshore shareholder-controlled entities identified so far. 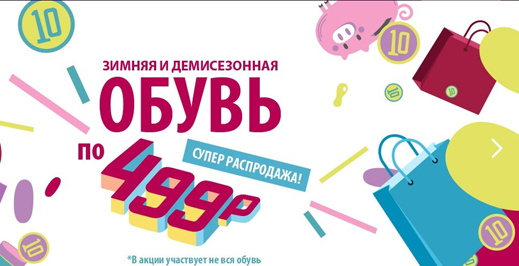 At TsentrObuv’s headquarters in Moscow, a source said by telephone that the company is “in liquidation”, though the group website is still functioning and offering a “super sale” for winter and “mid-season” shoes at Rb499 ($7.70). The company source added that she did not know what Nesterov’s current position is, or when he would appear at the office. She confirmed that before the court ordered the start of liquidation, Nesterov had been the company’s president. Nesterov was asked through the company’s press office to say if he remains a shareholder. He did not reply. Sun Investments in Moscow, Lomakin’s and Khachaturian’s vehicle, responds to telephone and fax calls with disconnection signals.